See our patients' smile transformations! At Dunlow Orthodontics, we constantly strive to provide the highest quality of orthodontic care to children, adolescents, and adults in the Bellevue, Omaha, Papillion, and Plattsmouth, NE communities. Dr. Neil Dunlow and our team make every effort to deliver premier customer service in a low-volume, patient-oriented setting where we’re able to give our patients the personal attention they deserve. Our ultimate goal is to create a truly positive experience for our family of patients. From the moment you contact our office, we want you to know we realize how very special you are. Our staff is smaller than in most offices you may have visited, and we think that’s a good thing! We’re dedicated to getting to know you by name and making you feel comfortable with us and your treatment. We also think you’ll agree our new, modern office is another tool that helps us create a very positive experience. We’re really pleased to have the opportunity to practice in an office that feels like home. 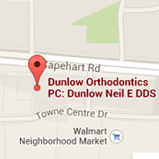 Dr. Dunlow loves to make his patients happy and help them get the smile they’ve always wanted. As a specialist in the art and science of orthodontics, he has extensive training in all aspects of tooth movement, smile aesthetics, and jaw function. We believe a healthy, beautiful smile can make a positive impact on your life. Contact our Bellevue orthodontic office and schedule a complimentary consultation with Dr. Dunlow. Let us help you achieve the smile of your dreams!